The Crooked Banana: A (Missing!) Finish- UPDATE: Found it! A (Missing!) Finish- UPDATE: Found it! The adorable little turtles from Les Amis! The flowery print was the lining. And you can see in the background- the first two strips of Hounds Tooth all sewn together! (YAY!) I absolutely adore this collection and plan on turning my fat quarters into a throw quilt for my house after Hounds Tooth is finished. But these little turtles are my favorite. I have always loved turtles and thought there was no better place for them but on a cell phone case I would get to look at every day. Except that plan is now ruined -.- It is possible that it is in my boyfriend's car. But since he's at work I won't know for sure until later. Just trust me. It was really cute. It even had a (poorly placed- let's blame the rum) snap closure so it wouldn't fall out! I FOUND IT. In Mario's car :D YAAAY! Here are some (poor) pictures. You can see that I only had sew on snaps... and they were black. And I had no black thread. So they're a little ugly. But it didn't bother me at all at the time. Must have been the rum. But whatever. It still keeps my phone from getting scratched in my purse! Which I discovered through Pinterest! 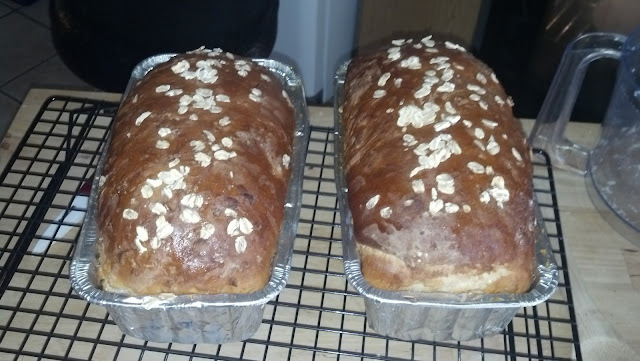 I was super proud of myself for actually making something I found on Pinterest instead of just pinning it and forgetting it :D It is honey oat bread from this recipe. I altered it just a little because I only had 9x4 loaf pans instead of 9x5. I did 1.5 times the recipe and it made two perfect 9x4 loaves :) It's really good. Nice and soft and sweet. It was FANTASTIC straight out of the oven with a little butter and it made delicious French toast yesterday! Linking up to Finish it Up Friday at Crazy Mom Quilts! Because I did finish something, darn it! I WILL find it and photograph it! Sounds like an awesome day to me, Congratulations to both of you! I'm glad you found the phone case --- those little turtles are adorable! Thanks! :) I thought it was lost forever, which would have been absolutely tragic.